LOCSignal Moving Average Cross. Produces signals on cross of slow and fast Moving Average indicators. 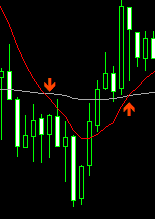 LOCSignal Moving Average Cross is an indicator which produces signals for LOCTrader EA. Also indicator can be used for manual trading. 1. Fast MA crosses slow MA from bottom to top. 2. Fast MA crosses slow MA from top to bottom. Lot Size: Constant. Minimal allowed for account. Indicator is Free and goes with the Source Code.